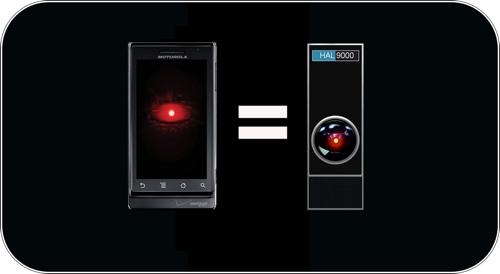 It may take a little movie knowledge to get this one but the first time I saw this phone I was waiting to hear it say "I'm sorry I can't do that Dave". The phone looks pretty damn impressive and I like the idea behind the Android platform, but that thing might some how eject you into space and kill everyone around you. To scary... If you've every seen 2001: A Space Odyssey you know what I'm talking about. If you're willing to take the risk check out the Droid and learn more about Google's Android platform.